Several polls today give contradictory results. In states such as Illinois, New York, and Oregon, Kerry's lead is shrinking to 4%, 8%, and 3%, respectively. 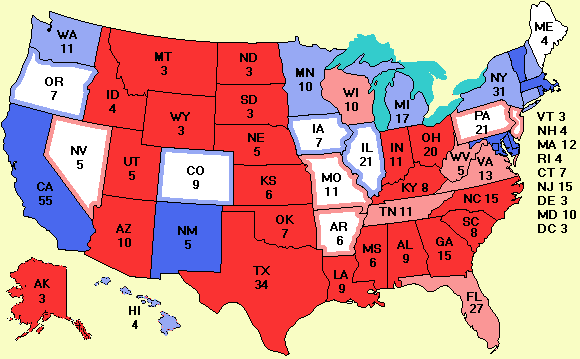 Bush is unlikely to win any of these states, but Kerry is clearly having problems there. In New Jersey Bush has now overtaken Kerry by a small amount. On the other hand, Kerry is doing better in some of the key battleground states. A new Gallup poll in Michigan puts him ahead 50% to 44%. An ABC News poll in Pennsylvania cuts Bush's lead to a bare 1%, 49% to 48%, a data point corroborated by the Rasmussen 7-day tracking poll. And in all-important Ohio, the Rassmussen 7-day tracking poll also puts Bush ahead by a mere 1%, 49% to 48%. The Strategic Vision poll stays in the spreadsheet for the moment, but tomorrow Rasmussen's becomes more recent and will take over. Conclusion: Kerry is slipping is some states where he was way ahead, but is making a comeback in the real battleground states. Some people with black & white laser printers had complained that they couldn't tell red states from blue states on the printout. Consequently, I had my computer guru tweak the colors to try to make all four colors distinct on black & white laser printers. I hope this scheme is better for everyone. Senate news: Oconomowoc construction executive Tim Michels won the Republican senatorial primary and will face incumbent Russ Feingold in November. Feingold is now very famous on account of McCain-Feingold. He is a bit of a maverick, but that is appreciated in Wisconsin. It will be close, but Feingold probably has the edge over the untested Michels. My first ad at a university newspaper site has appeared. It is at Ohio State University, which has 48,000 voters, excuse me, students, and thousands of faculty members and employees. The ad is at The Lantern. More ads at swing state universites are in the pipeline.